As one of the most diverse ranches on the market today, the Ranch at Bates Creek provides exceptional sporting opportunities with excellent privacy. 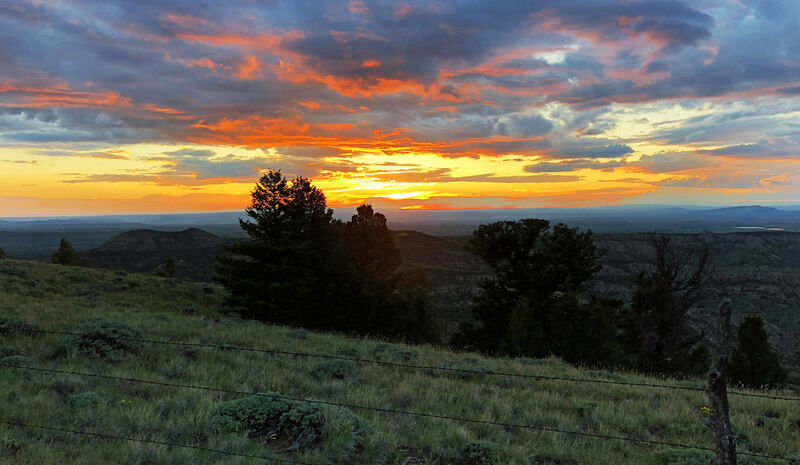 Only 45 minutes from Casper, the Ranch is easily accessible yet provides a distinct quality of seclusion. Perhaps it is the water rushing over the water fall into the pool below or catching large trout in the deep pools of Bates Creek. Somehow, you get lost in time and forget the cares of life on the outside world. 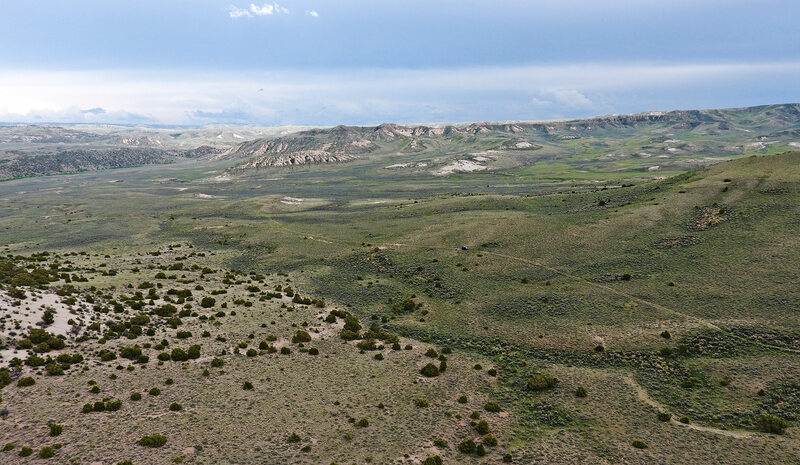 With 3,138 ± total acres, including 1,166± deeded, 1,506± BLM lease and 465± State lease, you have plenty of room to move about ­­­– hunting, fishing, hiking, horn hunting and rock climbing. 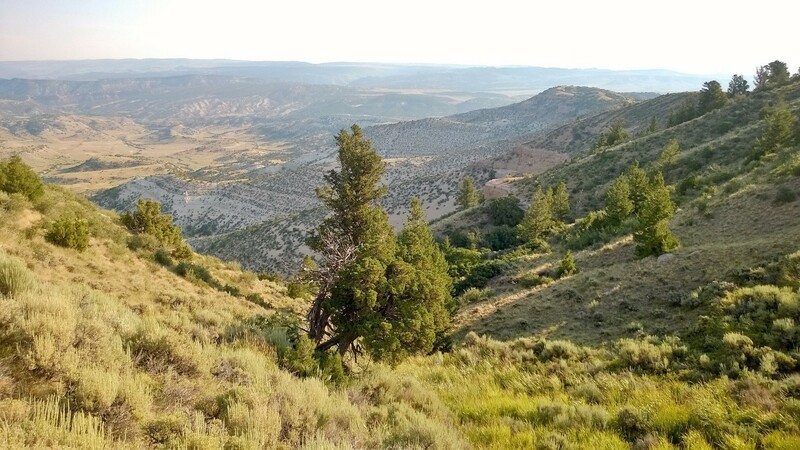 In addition to the deeded and leased ground, there is access to thousands of additional acres of adjoining BLM and State land. A restored one bedroom bunkhouse, an insulated Morton building, small workshop, horse barn, and corrals provide modest yet functional improvements. The lush river bottom attracts a variety of wildlife including elk, mule deer, antelope, mountain lion, sage grouse and turkey. 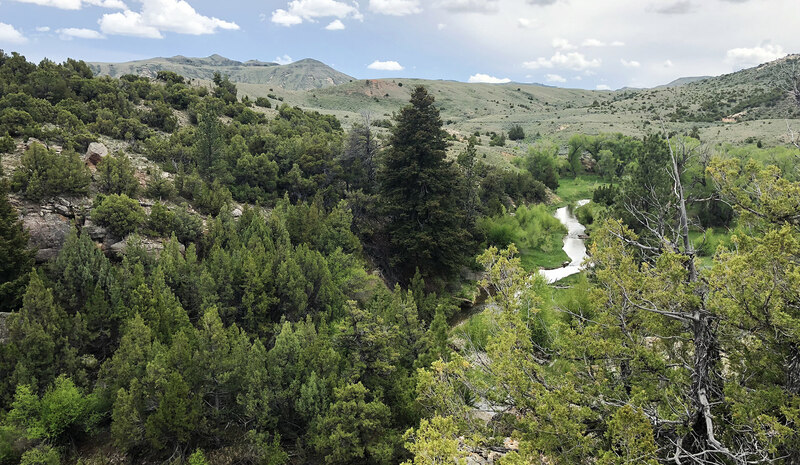 Located approximately 29.5 road miles south of Casper, Wyoming, via Highway 220 (12 miles), Highway 487 (9 miles), and Bates Creek Road (8.5 miles), the Ranch enjoys county-maintained access. Casper, situated along the North Platte River and at the base of Casper Mountain, is a friendly town with a population of approximately 59,000. Home to the Natrona County International Airport, known as the Gateway to Wyoming, direct flights to major hubs, including Denver and Salt Lake City, allow for simple departures and arrivals. As the second largest city in Wyoming, Casper is a regional center of banking and commerce, and offers fine dining, shopping, entertainment, and nearly any amenity one would need on the Ranch. The Ranch elevation ranges from approximately 6,200 to 7,200 feet above sea level. Casper experiences a semi-arid climate with cold, dry winters, wet springs, and hot summers. The average annual precipitation in nearby Casper is 12.59 inches. The Ranch at Bates Creek offers one of the most unique and diverse landscapes in the area. The riparian zone along Bates Creek, bordered by thick stands of Cottonwood trees and willows, canyon, gigantic boulders, and iconic waterfall, transitions to open sagebrush draws, hillsides of rock outcroppings, and scattered pine trees. The Ranch has been lightly grazed in the past few years with approximately 50 pairs for a 6-month grazing season leaving ample feed for wildlife. The Ranch at Bates Creek has been lightly grazed by 50 cow/calf pair for approximately 6 months. The governmental grazing leases provide for the following AUMs. The Ranch is watered by Bates Creek and a solar-powered well and tank. Bates Creek traverses the property for approximately 1.25 miles. With a combination of deep pools, riffles, waterfalls, large rocks and canyons, the diversity of Bates Creek is exceptional. The Ranch has direct flow irrigation rights from Bates Creek. A tabulation of water rights can be provided to qualified buyers upon request. The 2017 real estate taxes were $483.31. Electricity is provided by High Plains Power to the bunkhouse and workshop. Wired telephone service is not available and cellular communication is limited. A water well near the bunkhouse has been historically used for water. A new well has been drilled at a possible building location overlooking the waterfall. Many of the furnishing and personal property located on the Ranch will be included in the sale. 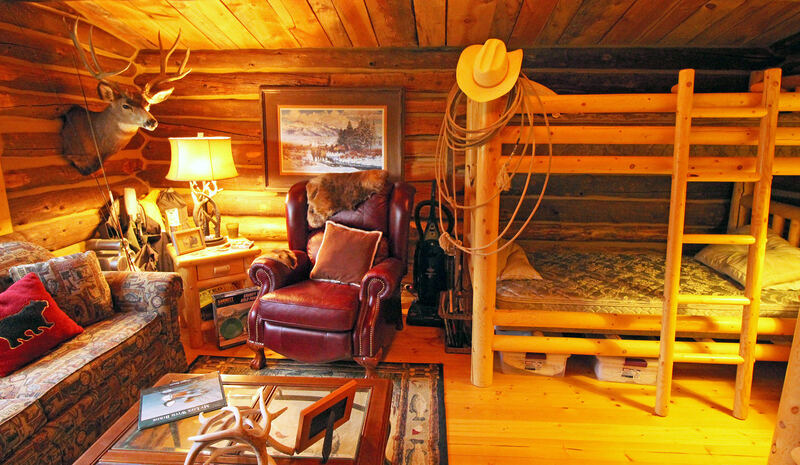 A list of personal property to be sold with the Ranch can be furnished to qualified Buyers. The Seller hereby makes known that there may be variations between the property boundary lines and the location of the existing boundary fences on Ranch at Bates Creek. The Seller makes no warranties with regard to the location of the fence lines in relationship to the property boundary lines, nor does the Seller make any warranties or representations with regard to specific acreage within the fenced property lines. The Seller is selling Ranch at Bates Creek in its “as is-where is” condition which includes the location of the fences as they now exist. Boundaries shown on any accompanying maps are approximate. The maps are not to scale and are for visual aid only. The accuracy of the maps and information portrayed therein is not guaranteed nor warranted. Most of the improvements are original structures from the Bates Hole homestead era. With the exception of the Morton building, the buildings are restored log structures which provide a distinct perspective of days gone by. 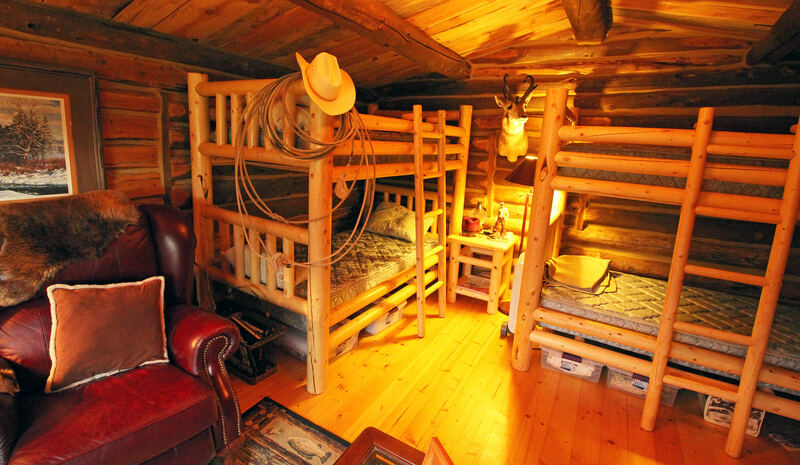 The restored one-room bunkhouse, which can sleep up to six people, is very cozy with two bunk beds, a sleeper sofa, two recliners, a coffee table, and a refrigerator. The cabin has electricity with electrical outlets and lights. The cabin does not have running water. Constructed in 2004, the 1,200 square foot Morton building has a porch along one side, steel siding, and a full concrete floor and apron. The small workshop provides space for miscellaneous tools and supplies. With an antique US army stove, the chill can be taken off when the weather turns. The horse barn is log sided and provides adequate shade and shelter for horses. The wooden corrals provide a unique look while also providing function for handling livestock. Many building sites can be found along Bates Creek if a new owner wishes to add additional structures. One particular site overlooking a water fall has a well and power nearby. The Casper, Wyoming area consists of a very diverse landscape. The town of Casper itself provides all of the essential and non-essential amenities. With many restaurants, various home building stores, ranch supply stores, shopping mall, hospital, and international airport, Casper serves as the hub of commerce for central Wyoming. Outdoor opportunities are endless for the avid hiker, hunter, fisherman, historian, and adventurer. The North Platte River, which flows through Casper and a series of reservoirs, provides excellent opportunities for lake fishing, river fishing and water sports. Nearby Casper Mountain serves as a local hiking destination and is home to the Hogadon Ski area. 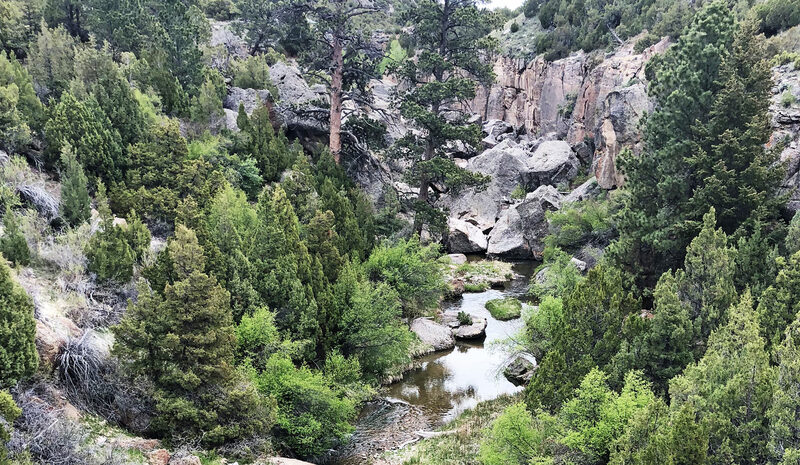 With numerous water sources flowing from the mountains through rock outcroppings, trees, and across the plains to the river, the wildlife resources around Casper are considered to be exceptional. The Ranch is home to a variety of wildlife including elk, whitetail deer, mule deer, antelope, mountain lion, sage grouse and turkey. 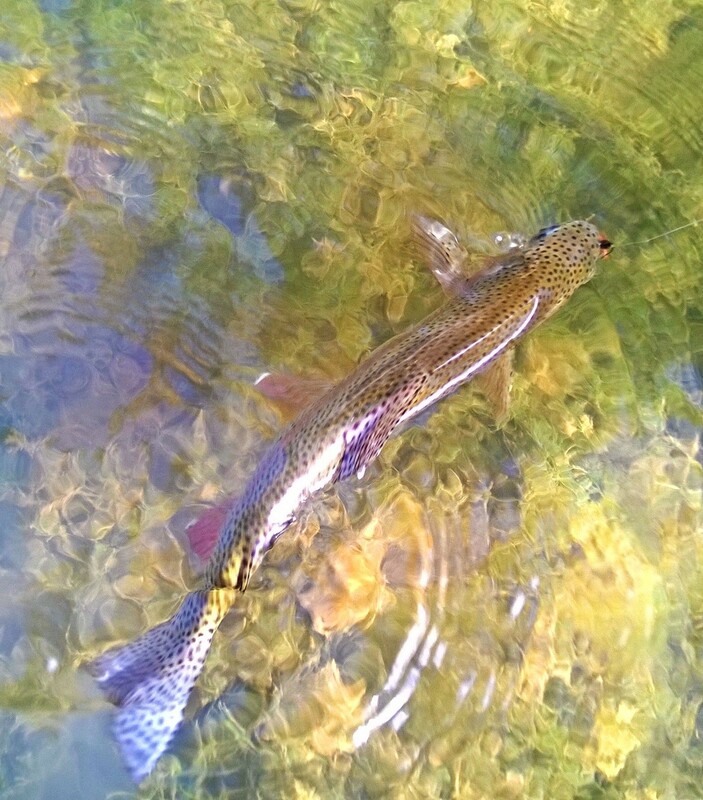 Bates Creek, which traverses the Ranch for approximately 1.25 miles, provides anglers the opportunity to fish private waters teeming with brown, brook and rainbow trout. With a healthy riparian zone of cottonwoods, willows and abundant grass, many species of wildlife are attracted to this space for food, water, and cover. 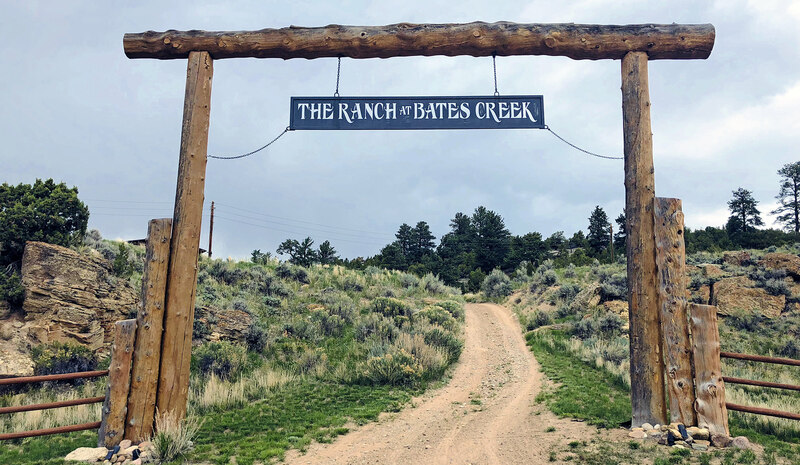 Situated on Bates Creek and amongst the towering cottonwoods, one can find the Ranch at Bates Creek. Comprised of 3,138 ± total acres, of which 1,166.5 ± acres are deeded, the Ranch is home to a variety of wildlife and provides excellent private fishing in live water. 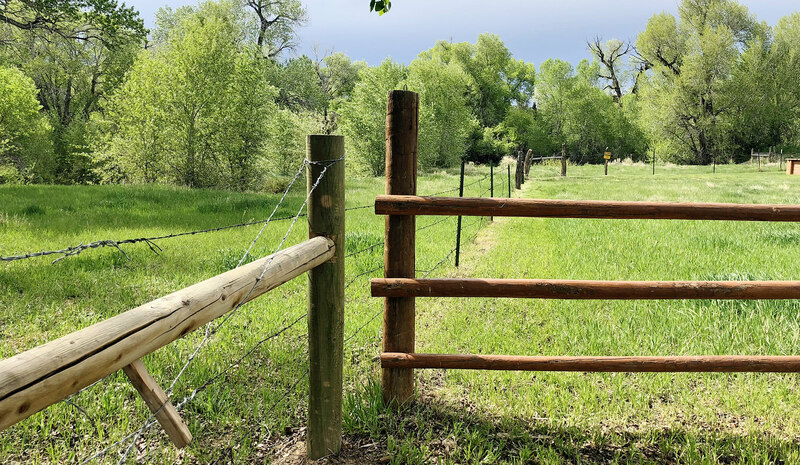 With a wide variety of topographical features including canyons, boulders, rock outcroppings, juniper trees, sage brush, and a lush creek bottom filled with cottonwood trees, the Ranch is one of the most diverse offerings on the market today. 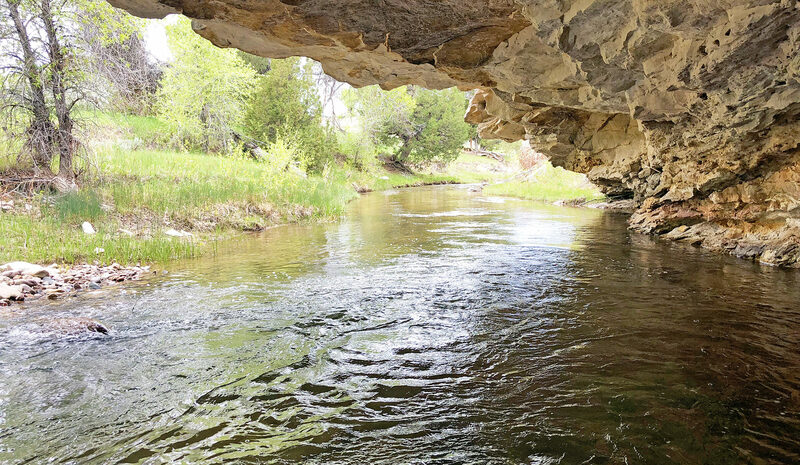 Buyers seeking natural beauty, seclusion, live water, private fishing and hunting opportunities will enjoy discovery of the Ranch at Bates Creek. Earnest money deposits will be placed in escrow with First American Title Insurance Company, Laramie, Wyoming.